WASHINGTON (AP) – On Wednesday, August 28th, the nation's first black president, a living symbol of the racial progress Martin Luther King Jr. dreamed about, will stand near the spot where King stood 50 years ago and say where he believes this nation should be headed. Then, like King, President Barack Obama will step away from the hulking Lincoln Memorial, and return to where this nation is now. As civil rights activists pause to consider the great strides toward equality that the 1963 March on Washington helped to spur, they also look at the current political and racial landscape, and wonder: How much of that progress is now being undone? This march anniversary comes just two months after the Supreme Court effectively erased a key anti-discrimination provision of the Voting Rights Act, unleashing a string of restrictive voting laws and rules in several states. The court also raised the bar for consideration of race in university admissions, and made it more difficult to bring employment discrimination lawsuits. There are other new issues, such as demands for a federal civil rights prosecution of George Zimmerman for fatally shooting unarmed black teen Trayvon Martin, and abiding ones, such as persistent unemployment among black Americans that runs at a significantly higher rate than that for whites. "A convergence of things have happened that have exposed ... the fact that we are in a pretty important moment, kind of a democratic crossroads in this country," said Sherrilyn Ifill, president of the NAACP Legal Defense Fund. "Crossroads or not, you have to continue the work of pushing forward." The observances begin Saturday with a march from the Lincoln Memorial to the King Memorial, led by the Rev. Al Sharpton and King's son, Martin Luther King III. They will be joined by the parents of Trayvon Martin, and family members of Emmett Till, a 14-year-old boy who was kidnapped, beaten and shot in the head in 1955 after he was accused of flirting with a white woman. 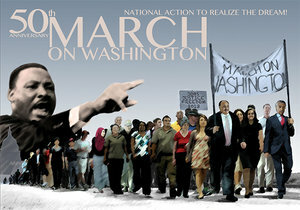 Sharpton has refused to call Saturday's march a commemoration or a celebration. He says it is meant to protest "the continuing issues that have stood in the way" of fulfilling King's dream. Martin's and Till's families, he said, symbolize the effects that laws such as the stop-and-frisk tactics by New York police, and Florida's Stand Your Ground statute have in black and Latino communities. "To just celebrate Dr. King's dream would give the false implication that we believe his dream has been fully achieved and we do not believe that," Sharpton said. "We believe we've made a lot of progress toward his dream, but we do not believe we've arrived there yet." Obama is scheduled to speak at the "Let Freedom Ring" ceremony on Wednesday, and will be joined by former Presidents Jimmy Carter and Bill Clinton. 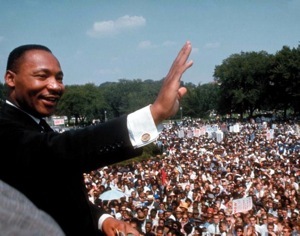 Along with their speeches, there will be a nationwide bell ringing at 3 p.m. EDT to mark the exact time King delivered his "I Have A Dream" speech, with which the march is most associated. The events were organized by The King Center in Atlanta and a coalition of civil rights groups. Separately, a smaller march, led by people who participated in the 1963 event and young scholars and athletes, will make its way from Georgetown Law School in Washington to the Department of Labor, then the Justice Department and finally the National Mall. The group plans to march behind a replica of the bus that Rosa Parks was riding in 1955 when she refused to give up her seat to a white passenger. Two months before the Aug. 28, 1963 march, President John F. Kennedy made a passionate statement about the morality of racial equality. He introduced a civil rights law that prohibited discrimination in public accommodations and called for stronger action enforcing the Supreme Court's 1954 Brown v. Board of Education decision, which struck down segregation in public schools. William Jones, author of "The March On Washington," said at the time of the 1963 march, the ideal of racial equality already was accepted by many. The primary goal, he said, was to call for strong federal enforcement of that ideal, and to push for a federal law prohibiting private employers and unions from discriminating against people because of their race. The current Supreme Court also accepted the ideal of racial equality, Jones said, and stated the need for it in its recent decisions on voting rights, university admissions and employment discrimination cases, but "backtracked" on the ability to enforce that ideal. "And in a sense that's exactly the situation that organizers of the march were dealing with," Jones said. In 1963, marchers arrived by bus, train, car and on foot on a weekday, many dressed in their Sunday best. Although marchers were mostly black, the crowd included whites, Jews, Latinos and Native Americans. At that time, it was daring to walk through the streets and march in protest, said Phil Schaenman, who was in Washington in 1963 working on the manned space program. An amateur photographer, he had gone out with his camera expecting to see a riot and ended up joining the protest. "I changed roles from being a spectator to joining in. I didn't realize I had stepped off the curb and joined in," said Schaenman, now a researcher on efficiency in local government at the Urban Institute. The Economic Policy Institute has been producing regular reports under the banner of "The Unfinished March" to emphasize what it says is the unfinished economic history of the march. Demands at the march also were made for decent housing, adequate and integrated education, a federal full employment jobs program, a national minimum wage that would be the equivalent of more than $13 an hour in today's dollars. The value of today's $7.25-an-hour minimum wage is $2 less than the minimum wage in 1968, according to the institute. "To truly honor the march, we also have to recognize the unfinished demands," said Algernon Austin, director of race, ethnicity and the economy program at the Economic Policy Institute. There clearly is far less overt discrimination today than there was 50 years ago, said Gregory Acs, director of the Urban Institute's Income and Benefits Policy Center. On the other hand, eliminating overt discrimination has bred insensitivity to the impact of policies that on the surface are said to be race-blind, such as jailing people for minor drug offenses or creating barriers to voting to make elections cleaner and more fair, Acs said. "We still have a ways to go, but that we can have the conversation and continue having the conversation - there's clearly progress," Acs said.